San Diego Police are not planning on having a larger presence in OB on July 4th, Lt. Natalie Stone told the OB Rag. “We’ll have the same presence as always,” the Western Division police lieutenant said. Maybe, she added, we’ll add a few more people. But that’s it. Nobody is expecting police, she said, to prevent anything from happening. There had been some fears that an increased police presence at the beach during the fireworks and any aftermath could spark a disturbance with booze-fueled young people. Normally, the police are present, but not in any huge numbers, and usually the officers have smiles and are getting into the spirit of the event, even when their patrol cars are pelted with marshmallows. The police are part of a joint effort to curtail the marshmallow throwing, with the Town Council and merchants, Stone added. But Lt. Stone was fed up with the gooey mess left by the marshmallows. “I had to soak my boots for days,” she said, “to get the mess off of them.” She went on, the goo is getting in their cars, in their equiptment, “it’s ruining our equipment,” she said. The low-key approach planned by police was also confirmed by Chet Barfield, assistant to Councilman Ed Harris. “No one will be going around handing out littering citations,” Barfield said. But, “enough is enough.” That’s where Harris is on the issue, said Barfield. 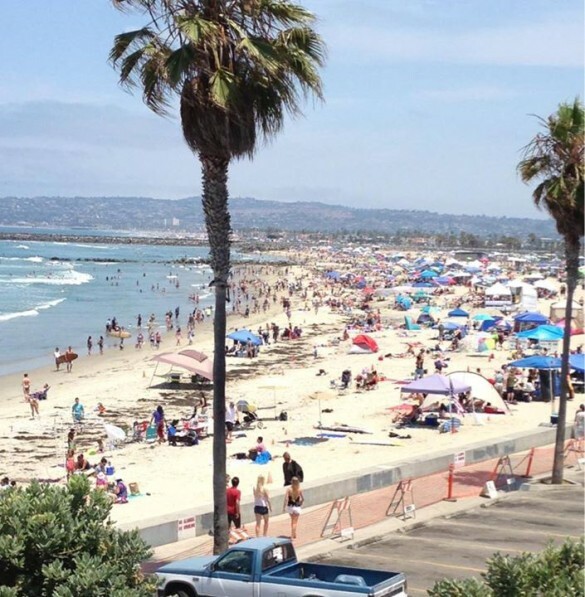 The Councilman is expected to attend a press conference along with the police hosted by the Town Council in several weeks to announce to the San Diego public that the community is asking people to forsake the event and not bring marshmallows to the beach for the night-time throwing. The press conference will be on July 1st, at 10 am at Veterans’ Plaza, at the foot of Newport Avenue. Over the years, over the decades, the police have increased their presence in OB during the Fourth of July. The police now routinely take over the Lifeguard station parking lot as well as the Pier parking lot at times. But as reported, there is no plan to dramatically increase their numbers in OB on this Fourth. Great photo of the beach at OB on the 4th by Jon Carr. The uniqueness of OB and the lure of it’s July 4 traditions, with the fireworks off the pier and the surfers in the water, followed by the joyful marshmallow throwing, bring customers to OB that help all the businesses on the main drag I’m sure. If we try to control things too much, and take away all the spontaneity and relatively harmless fun, we may loose our patrons, not to say are awesome OB vibe! From what I could tell last year, the marshmallow throwing isn’t just some hooligans and drunk young kids, but a family affair. I saw many kids sitting on their folks shoulders, older folk and families of all sizes joining in, laughing and participating in this unique community event. I really think a good solution to the after mess would be just to hire some people who need and would appreciate the work to clean up after. Let’s take a poll on that or some other solutions apart from stopping it altogether. I also suggested that we try redirecting it into some kind of marshmallow festival, with a limited area, perhaps a stretch of the beach, designated for throwing. This would be preferable to trying to prevent the tradition by brute force, I thought. However, my suggestions were met with a firestorm of verbal abuse from conservatives who vastly prefer the application of brute force, even though it’s ineffective and has many negative side effects. Good luck trying to convince anyone. If we lose patrons during July 4th because they can’t trash our beach, I don’t want them in our town anyway. Do you have a business on Newport? You sound like you have a financial stake in this. We as a community had a forum last year. Those in favor of keeping the fight didn’t really have a leg to stand on and their arguments in favor fell short of convincing. You will not “lose patrons”, you will foment a riot. And the marshmallow war will not stop either. It doesn’t matter what anyone said at some forum. You can either redirect the marshmallow war into a festival or a contained area, or you can redirect the marshmallow war into a marshmallow war plus a riot. But those are the only choices. “Foment a riot”?!??! Whoa. You mean like the one in PB that sealed the deal on the booze ban? The Great OB Marshmallow Rebellion of 2014…. has a nice ring to it. The police are making a big mistake if they are not planning a significant staffing increase for this 4th. It falls on Friday and with the predicted weather, this will be the biggest 4th in a decade. More police = more violence. This “tradition” is a stupid and irresponsible event that should go the way of the Dodo. I wonder how many participants in this event are also the same people who protest Sea World and want the whales freed. Bunch of hypocrites who care nothing about the environment or the harm that this “tradition” does to local wildlife. Whoa, there, “sane” voice – you just combined two probably disparate groups – those who want to see the marshmallow tradition continue with those who want SeaWorld to “free” the orcas. Does not make any sense to do that – not at all “sane”. What I’m implying is that I think there’s probably a sect of people who want to vandalize OB every 4th of July for their “tradition” without thinking/caring about the environmental ramifications of their actions while the next day they’re vilifying Sea World for keeping animals in captivity, etc. You’re implying that because you don’t listen to what anybody else says, you just have your own ideas fixed in your tiny little brain, immovable and unshakable. And your real justification for opposing the marshmallow war has nothing to do with “the environment”, that’s just an excuse. Your real reason is either that you got hit by a marshmallow, or you had to clean them off your car or house. You could start by at least being honest, if not “sane”. Sorry, Aging Hippie, but you’re off the mark. I haven’t had to clean them off my car or house. I’ve had to clean them off my beach, your beach, our beach. You can try and color it any way you like, but this “tradition” you refer to has degenerated into an excuse for violence and vandalism, plain and simple. Insult me all you like, but the fact remains that this event is not supported by our elected officials on the OBTC and the residents of OB. It cannot be halted, only redirected or contained. If you choose to try to halt it, you will redirect it into a riot, like we used to have on New Years’ Eve in Fort Lauderdale. If you choose a more constructive path, such as a designated area or a sponsored festival that includes a designated area, then it will evolve into a more positive tradition. It’s already bordering on a riot. Wanna trash the beach ? Go to Pacific Beach then. Not in our town, not in our home, not in our OB. You cannot stop it. Why is that so hard for you to understand? It cannot be stopped. It can be contained, or redirected, but it cannot be stopped. How many times will it take before you’re able to understand this simple premise? Got it now? Finally? Now, do you want to do something about it? Then pick something that can be done, that will work. Or flap your arms and fly to the moon, you have the same chance of that. All traditions are stupid and irresponsible. If we want to turn the tradition into a positive thing, then we should make it our objective to contain and/or redirect it. If we want it to turn into a full-scale riot, then we should try to halt it by brute force alone, using police. It’ll be dead and forgotten by next summer. If it is, then mission accomplished. If it isn’t, then still mission accomplished. Win-win either way. Tyler, Sane Voice, et al – please stop feeding the blog trolls. This conversation has become ridiculous, and hard to stomach. I’m with you, an overwhelming majority of the community residents and business owners are with you. The message is clear, simple and respectful: please stop throwing trash on our beach and streets for the rest of us to deal with. Period. There is no marshmallow Gestapo. There is no plan to have cops arrest people. Talks of riots is ludicrous, dangerous, and not grounded in reality. So everyone Mallow-out. That’s it. I’m done, I cannot read this thread any longer. The misinformation and paranoia is making me nuts. Happy Friday the 13th all! Cheers! I will be there on the 5th to tell you all “I told you so”.